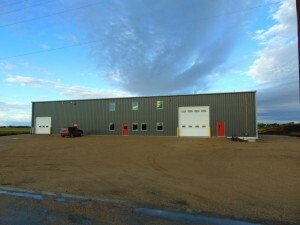 Located in Rosenort, Manitoba this building is a 140′ x 110′ Behlen Steel Frame structure. This manufacturing facility consists of a Welding Room, an Assembly Room, a Machining area with a 50′, 10 Ton Overhead Crane, as well as a Shipping, Receiving area with 2 3 Ton Overhead Crane at both ends of the Drive through bay. The building also has a Mezzanine floor for ample Shop Storage.The font office space consists of a Wash Room, a Lunch Room, a Meeting Room, an Office, as well as a mechanical Room and a main Lobby with a Reception area. The Building has in floor heat throughout.